We have carved a niche amongst the most trusted names in this business, engaged in offering comprehensive range of Copper Oval Plate. We are highly acknowledged organization engaged in presenting remarkable range of Oval Cafe Duo Areca Leaf Plates to our customers. 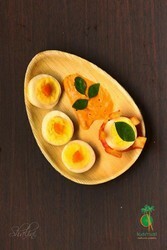 Offered Oval Cafe Duo Areca Leaf Plates is quality approved. Over the years, we are into the field of exporting to our clients an exclsui9ve array of Stainless Steel Oval Plate. 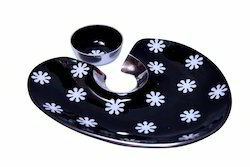 The offered plates are made by using high quality stainless steel that has high gloss and finish. We provide these plates with oval shapes that provide to the customers an exceptional lunch or dinner experience. i) Shapes: Round, Heart, Square, Rectangle. Keeping the diverse requirements of customers in mind, we are instrumental in providing Oval Shaped Plate.